Lukianenko, Maria [Марія Лук’яненко], née Zlobynets – teacher, active in community affairs; born on 21 November 1891 in the village of Domantove (Zolotonosha raion, Cherkasy oblast, Ukraine; at that time – Domantiv, Zolotonosha county, Poltava gubernia, Russian Empire); died on 1 July 1960 in Rochdale, England, United Kingdom; buried in Rochdale. Married Anton Lukianenko. In 1948 Maria Lukianenko moved to the United Kingdom and settled in north-west England. She lived initially in Preston and then in Rochdale, where she worked in a cotton mill until 1957. In 1949 she initiated the founding of the Rochdale branch of the Association of Ukrainian Women in Great Britain (AUW) and was its first head for three years. In 1950 she assisted in the founding of the AUW branch in neighbouring Bury. At the AUW annual general meeting in 1950 she was elected deputy head of the Association but subsequently resigned on the grounds of ill health. From June 1950 to 1952, with the assistance of the Rev. Justyn Hirniak and Anton Lukianenko, she ran, at her home, the first Ukrainian Saturday pre-school nursery in the UK. After it was transferred to the local branch centre of the Association of Ukrainians in Great Britain (AUGB) she became an advisor to the nursery. 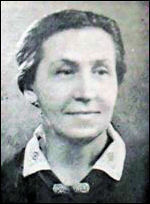 In 1954-55 she was the first teacher of the Ukrainian supplementary school at the Rochdale AUGB branch. Together with Anton Lukianenko she ran training courses for Ukrainian pre-school nursery teachers (held in 1954 in Bury, in 1957 in Rochdale), and she was the author of support materials for nursery education. In addition to her work in children’s education, in 1952-53 she gave courses, in Rochdale, on the history of Ukraine for adult students of the Distance Learning Institute (founded by the Ukrainian Free University). In 1952 and 1953 she was elected to the AUGB Governing Council. She was the author of a retelling, in Ukrainian, of ancient Greek myths, which was published in instalments during 1960-61 in the Vyzvolnyi Shliakh (Liberation Path) journal under the title Starohretski mity.